I had the first week of MOPS for the school year while Mom was here so she went along with me. My helper mom this year is my MIL and both our moms are friends so they enjoyed the morning together. I had 3 kids in the room that day and reminded them that my “name” at MOPS is Mrs. M— and that “this one” will be our helper in the room each time and she is also Mrs. M–. The kids were surprised!! My MIL isn’t thrilled to be called that so we call her Grandma M as that is what I’m used to calling her. To add more intrigue, I introduced my mom and they were so surprised that MY mom was there from so far away and that the other one was my husband’s mom. It was fun! 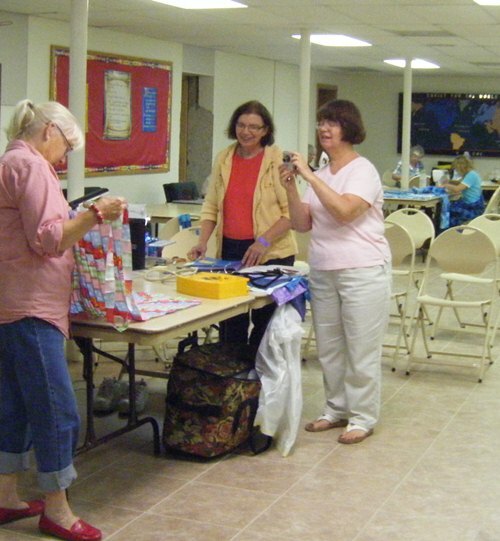 One evening we went to the PC Quilt Guild meeting. It was an extra-special speaker that night and whereas most months we may only have 1 or 2 guests, this time my mom was one of 18 visitors to our guild! Many, many of my guild friends (members at this one and members at the other one I’m in) were thrilled to meet her and introduced themselves. Mom & I even had show & tell to share! I prepared this embroidery for her to work on and she brought it back all done! I still need to do piecing of trees for the border and quilt it for a table runner. She does beautiful work! I couldn’t see a pencil line of the pattern left! I’m not sure how she did all this of white & gray floss on white fabric! The second Sunday she was here was an open day for Miss K and we all met in the middle for a wonderful dinner! Once again, mom was the charmer and attracted the attention of the owner of the restaurant! He came to our table and welcomed us, shaking mom’s hand and then giving her a light kiss on her head when he left. After we had finished our meals (well, as much as we could eat and had packed up our leftovers! ), Mom & I visited with the owner again. Soon our waitress came to our table with a full serving of their dessert beignets compliments of Mr. Vitalie! Beignets with marshmallow cream and a chocolate swirl for dipping! We were sure our stomachs had not one more inch of space but warm beignets fit in there just right! 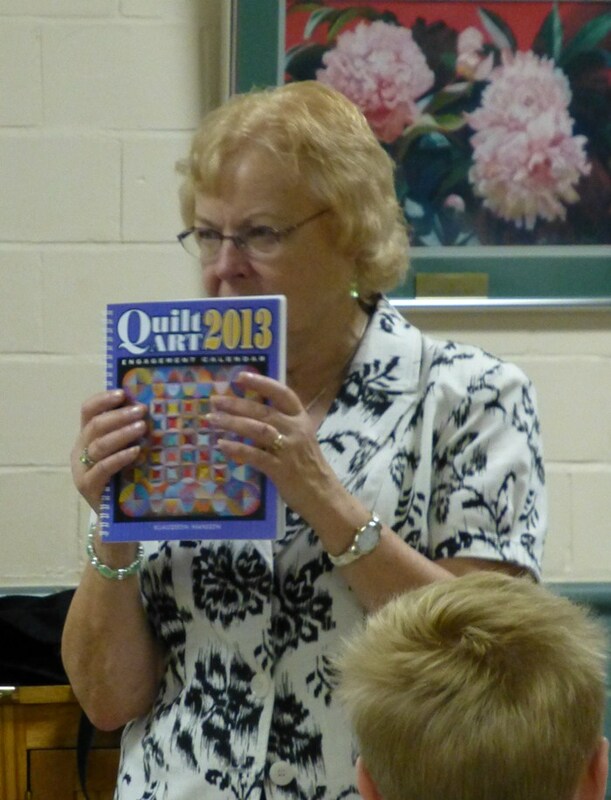 I am a member at 2 local quilt guilds and both of them had guild shows this year. One weekend and then the next. I gave more of my time and resources the first weekend to the smaller guild and where I attend more regularly. Beginning of set-up. We rent a church gymnasium and then have quilt hanging poles and all the system to make the show a go in a gym! These workers are so smart and speedy. I need to get trained to help out for next time, I guess. I’m guessing there were about 4 more rows than the 5 you see here. 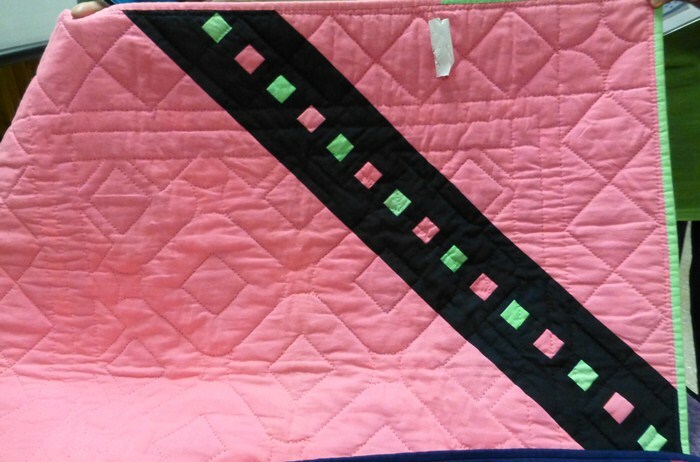 Quilts are able to hang on both sides of a rod across the top that is covered in clean fabric. I appreciate the good care the quilts are given with this display. 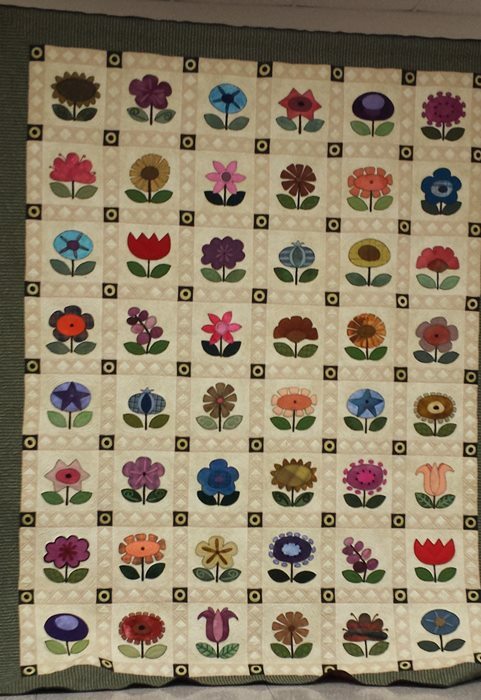 The smaller quilts are pinned to a carpeted wall or displayed on a table. 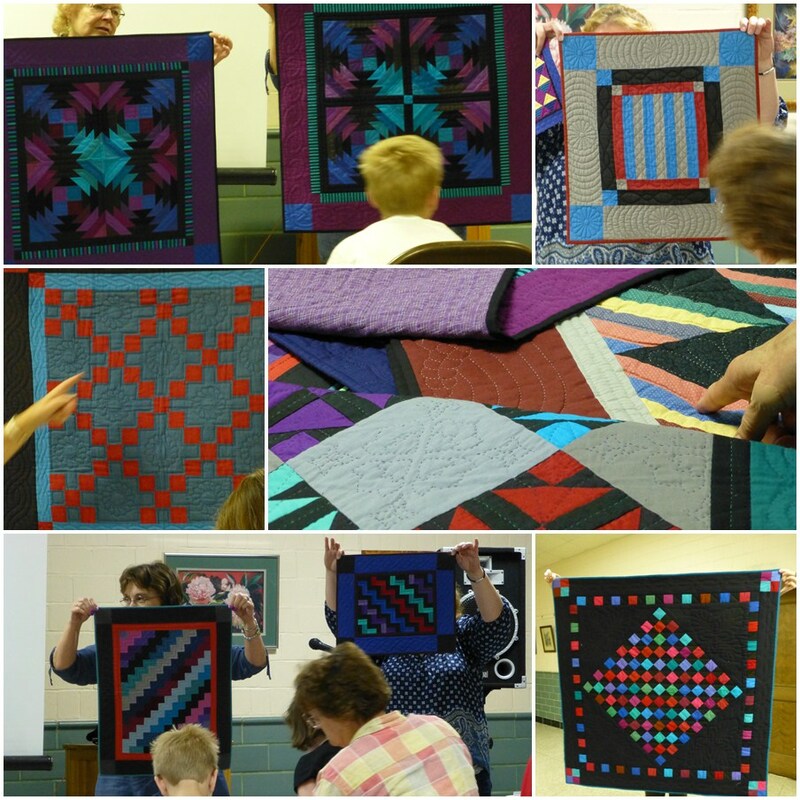 This guild offers a challenge area for each show and here is a photo of all the quilts entered in the challenge. I thought there were 10 entries but maybe just these 7 I got in my photo. Top Row L to R: My signature quilt from 2009 of guild members and some quilting friends. Infiniband Encased is made for a hanging in JP’s room. My scalloped Christmas tree skirt. Bottom Row is me with my challenge piece and K’s signature quilt from her high school graduation. I spent most of the first day there. In the morning, I was a white glove volunteer… keeping an eye open all around and letting others see the backs of quilts if they wanted. I had 2 of my quilts appraised in the early afternoon. The ladies in the guild are so sweet to hang out with for the day! I didn’t take many photos at the other show with limited time and I took the same quilts for display. 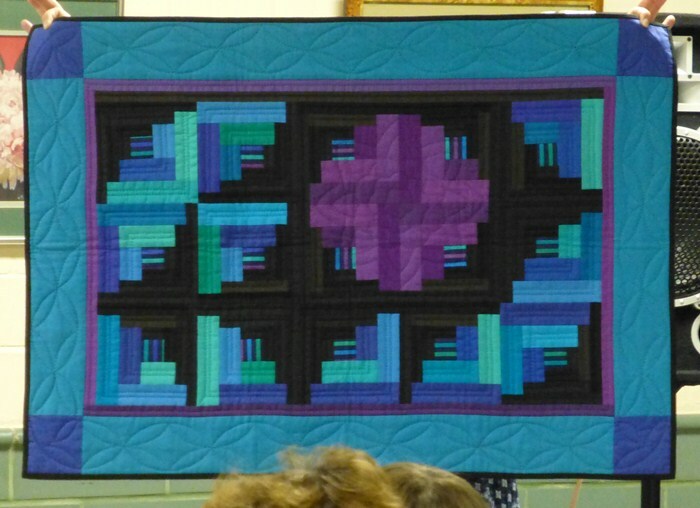 I liked seeing the contrast of lights & darks in this quilt as well as the lovely feather quilting. I decided in the middle of these shows that whenever it randomly happens that both shows are in the same year, I’ll only participate in one. Both had different rules for entry of quilts, neither followed the rules, and it was another plate I didn’t need to spin during harvest! 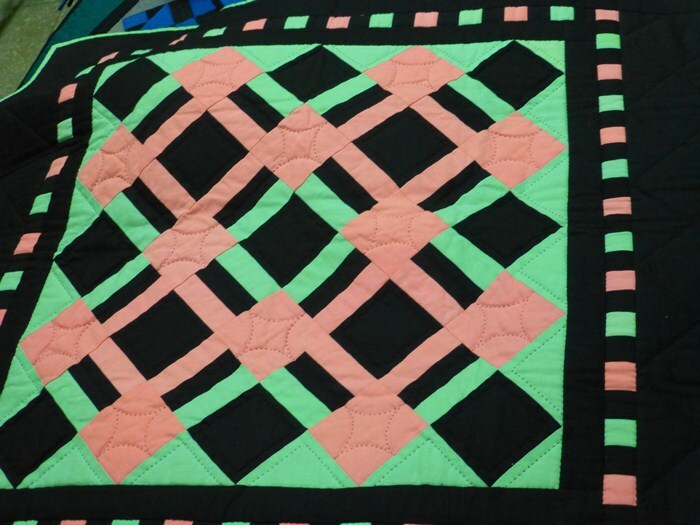 But meanwhile… I love quilts and seeing what others are making locally without the big time of an international show. 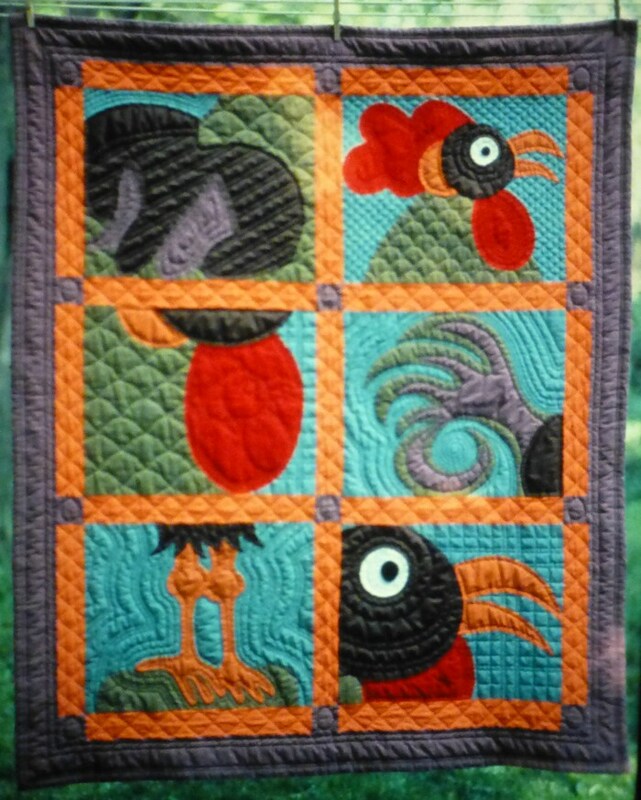 This year for one of the quilt guilds, we have a UFO challenge. Before our first meeting of the year (March b/c Feb we were snowed-in), we filled in a form with 5 UFOs we’d like to complete this year. (UnFinishedObject… in this case, a quilt) I wanted to participate but have clearly told myself that it may not be something I can accomplish every 2 months. The program chair collected the forms as we arrived and then randomly pulled a number during her report. This month (to start in March and bring to the meeting in May) is number 5. I checked my form at home that night and my #5 is the only one that I put on the list that isn’t started. Nadda. I have pattern. I have the fabrics. I have the reason I want it. Not started. In 2 weeks, I have colored in the black & white pattern and cut pieces for 3 of the 4 accent colors. Enough cutting to get my will power going so I’m eager to squeeze in work on this. 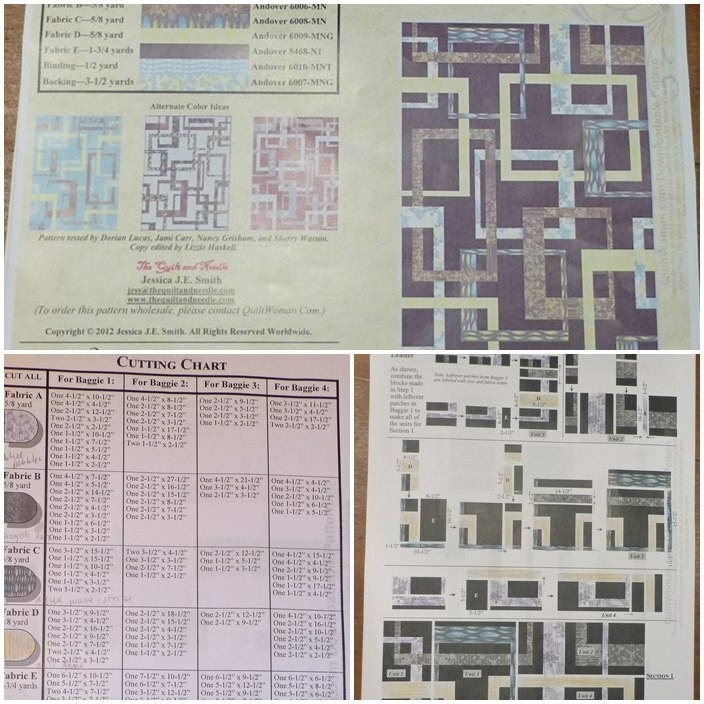 Outside the Box — pattern and a few pages of the “pattern from hell” and the most complicated one I have ever seen!! I got a bum deal on the pattern. Found the pattern and fabrics at a booth at a quilt show. Looked over the pattern in my room that night and thought – what a nightmare! 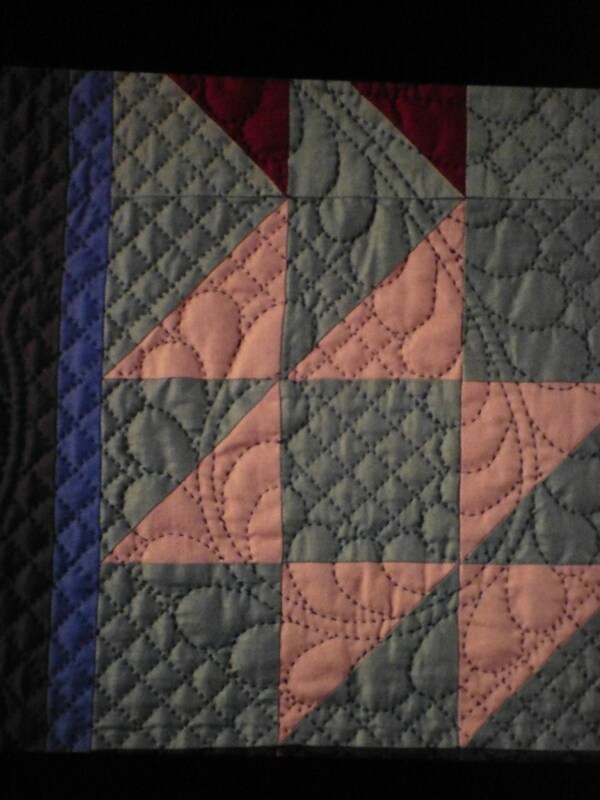 Once home, I looked online for ways other people had made the quilt and found not. much. Then I found the pattern writer and her website. It is a download purchase so I assume in color. And $2 less than I paid for the black & white at the show. 😦 I’ve tossed & turned about giving another $10 for the color pattern but one evening just colored A, B, C, and D fabrics with colored pencils for the cutting and assembly pages. All will be well. The cutting is 1 piece at a time. Slow. But steady and all has gone great so far. The cut pieces are sorted per instructions into the 4 bags as I go. Maybe but still no betting… it will be a top at least by the May meeting. Hoping it is a good planting week and I can feed the men and get to the meeting. I’ll take as much as I have finished. The background is a light aqua from Kaffe and the 4 accent fabrics. Who knows what color shows on your monitor. It will be a large wallhanging…whenever finished. I’m calling this project Number 5 (#5) for now for many reasons. UFO list item #5, for our child #5’s room are a few things. 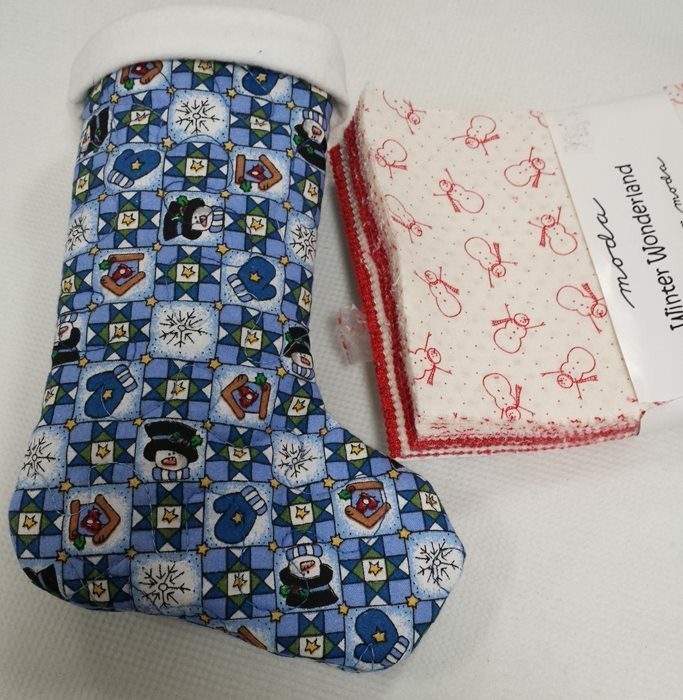 Part of the Christmas meeting at one of the quilt guilds I attend was a stocking exchange. 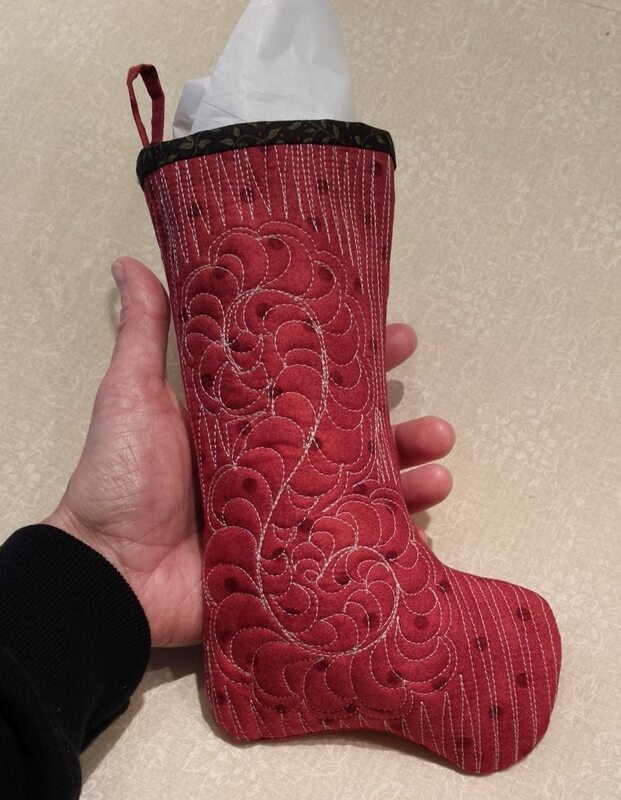 We were given the pattern earlier and were to make a stocking and add up to $10 of goodies inside. At the meeting, all the stockings were laid out on a table. So cute!! 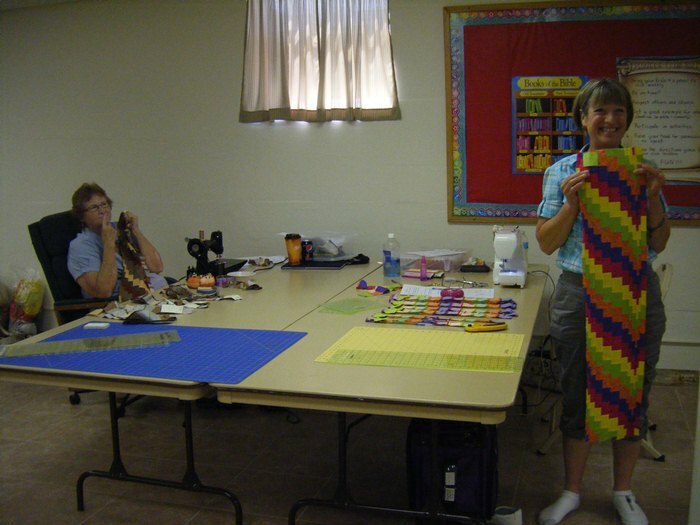 We had a potluck supper and a short meeting where we got to see the guild’s raffle quilt. Let me know if you want tickets. 🙂 The drawing for the quilt will be October 2015 at our guild quilt show. 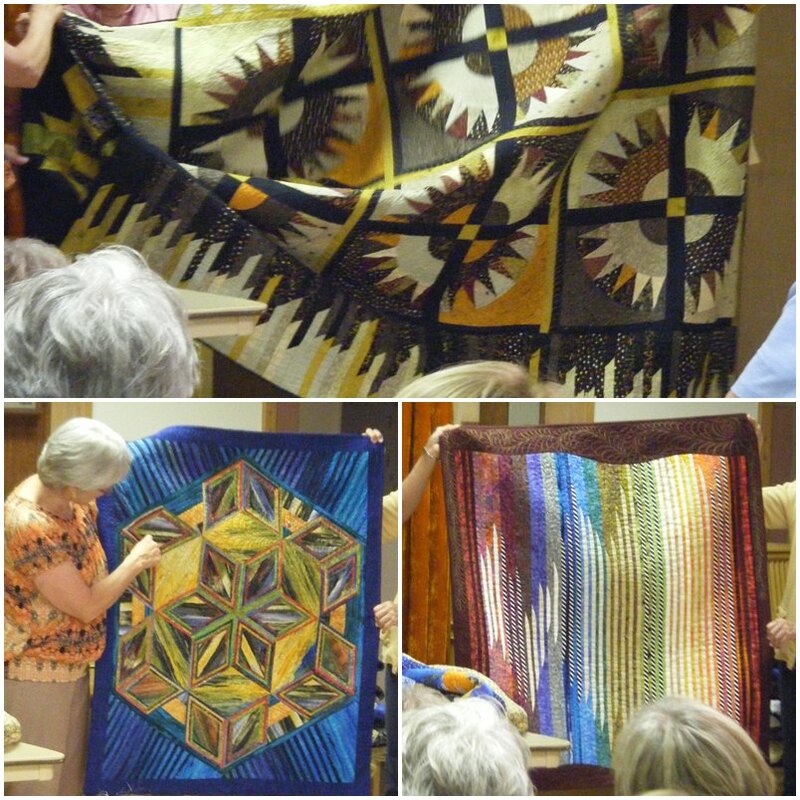 She shared her knowledge of Amish quilts with us and also brought along her trunk show of Amish quilts. First a slide show. Can you believe this photo above and the one below are from the back of the dark room to the slide on the screen?! Love the camera!! The quilting on this quilt is stunning! Glad I could capture it a bit in this photo. I’m seriously not sure how this fits in besides it is solid fabrics. But… maybe her daughter made it? I was too frantic grabbing my camera before she changed the slide, I think. 🙂 Very funny! 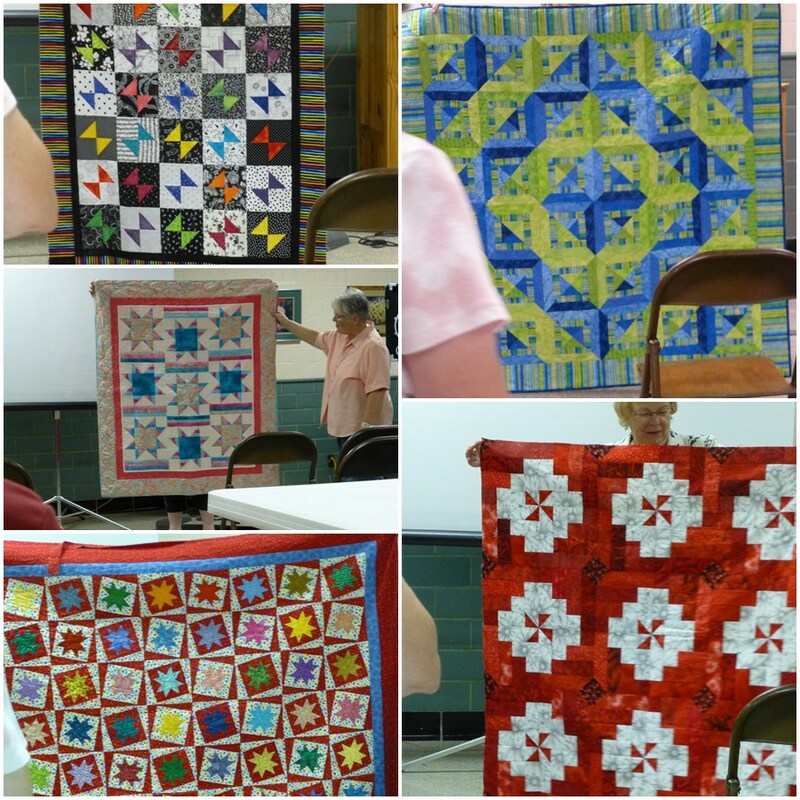 Above is a page of her own Amish style quilts. Click the photo to see them in a better size. This one missed the collage page. I love the layout of the off-center log cabin. Above — from show & tell. Some guild quilts and some are Klaudeen’s. The wonky stars (bottom left) was a good example for the class she was teaching for the guild on Tuesday. Klaudeen showed this quilt and my friend, Patti, & I loved it!! 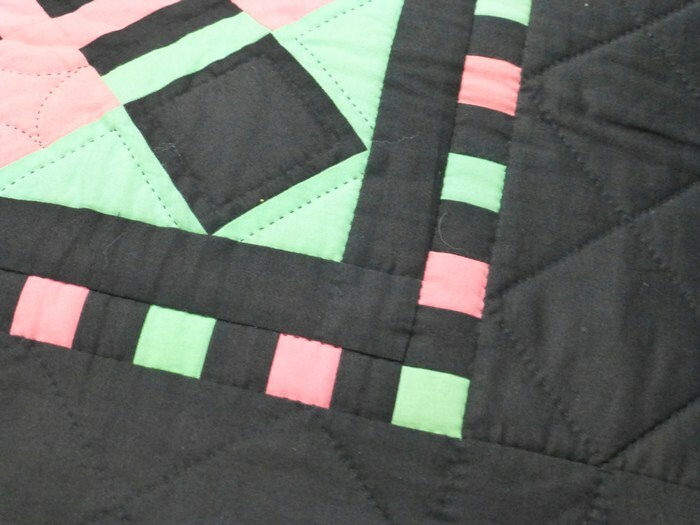 The colors seem a bit off here… hot pink & neon green with the black!! 🙂 Patti got the pattern so we both want to make one of these. Look out show & tell! 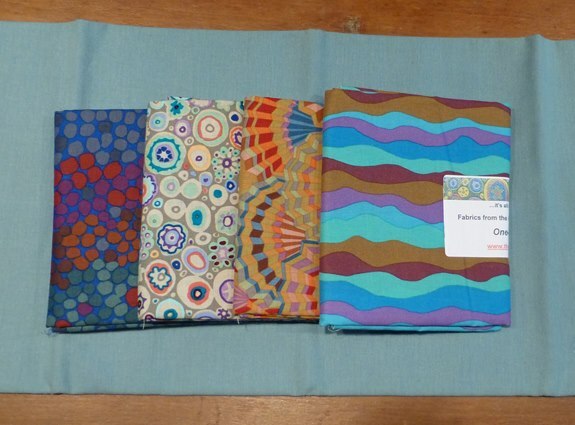 (well, give us a few months…) I have my fabrics already (I got Kona cottons) and I chose not to go with the neon look. But of course, PINK is there. I will miss the other guild this month so we’ll see you next month for more guild meetings!